I got Smoky when he was a kitten and about a week or 2 later I got his brother, Token. I still have both cats. They are indoor cats and they sleep on my bed with me. Smoky likes to give kitty kisses. Editor's note: Thanks so much, Steph, for sharing a pic of Smoky and Token! 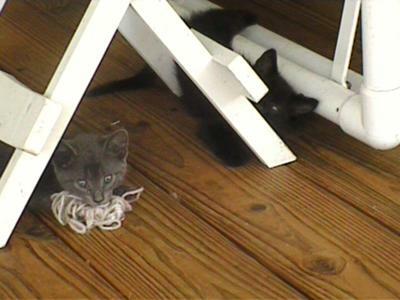 I'm guessing Smoky is the gray one. Is that a toy in his mouth? He looks very protective of it!